Naruto does not own this photo. A federal judge ruled on Wednesday that Naruto, the smiley six-year-old who became internet-famous for shooting the best selfie ever back in 2011, does not own the rights to his art. The suit had been filed in September by People for the Ethical Treatment of Animals on the macaque’s behalf, and today it was declined. However, PETA has 20 days to amend its complaint and make another intellectual-property claim for the Celebes crested macaque. Wikimedia, the foundation that runs Wikipedia, thinks the public owns the copyright of the images Naruto snapped. 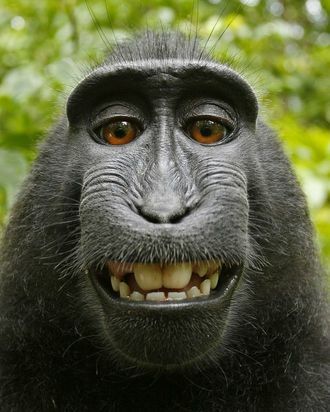 David J. Slater, the photographer whose camera the macaque snatched, thinks the picture is all his, having argued to the BBC in 2015, “It took three days of blood, sweat, and tears … in which I had to be accepted by the group of monkeys before they would allow me to come close enough to introduce them to my camera equipment.” Slater does, in fact, hold the British copyright. He also published a book of photos via the self-publishing platform Blurb that included two pictures Naruto snapped, prompting the PETA lawsuit. PETA disagrees. The animal-rights group wants this to be a landmark case, defining an animal’s right to own property rather than being it.